December : getting in the Xmas spirit but a time to reflect on 2016 and looking at what’s to come and what I can improve in 2017. I’ve had an amazing year and I’ve been delighted to share it with Horslyx . My horses have been consistent and I’ve been so lucky . Some fantastic results and I feel privileged to of been able to compete at some of the better known venues on the equestrian calendar. Looking forward to 2017 and as well as my super star horses Cadillac and Storm Surge I have a few new rides to also look forward to which is very exciting. 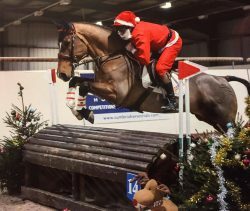 I finished the year of competition in Xmas costume as father Xmas at the Cumbria horse trials arena eventing where Cadillac surprised us all winning the speed class, it was the first time he’d seen cross country style fences and just took it in his stride .